Bold lines and feminine ruffles strike the perfect balance between modern and traditional with the Modern Twist Shawlette! The super soft and lightweight qualities of Aloft will have you wanting to wrap this chic shawl around your shoulders on chilly summer evening and cool autumn days. 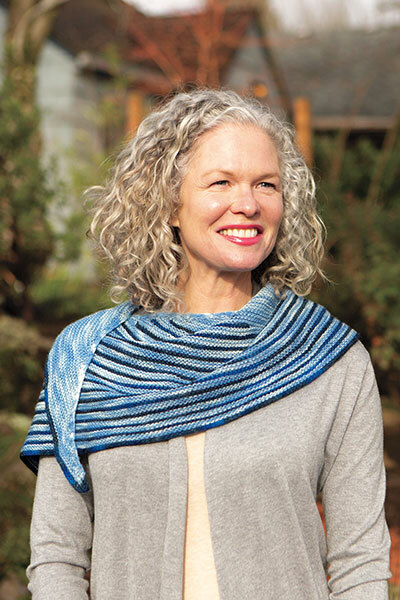 Knit sideways, the shawl is broken into 19 segments which form a near-circular shape through a series of increases, decreases, and short rows. Two colors of Aloft are worked together with Intarsia to highlight the unique shape of the Modern Twist Shawlette on the top, while an elegant ruffle on the bottom edge shows off a fluted lace motif for a traditional touch. The Modern Twist Shawlette cures your craving for delicate late with a contemporary flair!